Got in my first SS4 game of the year, a teaching game against Steve, a new player who seemed to enjoy the experience and pick it up pretty quick. The mission was The Rescue, with an anachronistic clash between The Minions of Robespierre [FR] and the mutant terrorists called NewGen [EQ]. Not really a narrative game, this was more of test to see how some newly painted and statted teams played in a proper game. The Minions of Robespierre have captured the VIP and are holding her near the statue. It will take a little while to complete the spell to return back to 1793. Glock Roach and Creepy Crawler approach from behind a shack. The Freerunner, Chupacabra and Natural Selection are spotted and Monsieur de Paris charges towards them. Creepy Crawler summons a horde of rats and bugs to provide some cover. Unfortuantley, Les Enfants Terribles can scent their enemies and fly over the landscape like wailing banshees. They swarm the mutants but don't manage to drag them down. With his friends in trouble, The Freerunner speeds across the graveyard. Chupacabra uses his super senses to scope out Tarrare's weaknesses. Creepy Crawler calls in his "pets" for help and the vermin make quick work of the vampiric children. Glock Roach opens up on Hommes de Bonbons, wounding him, but failing to stop the Hermetic chant. Natural Selection and Chupacabra start out strong against Monsieur de Paris, but struggle to drag him down. The Freerunner hits Hommes de Bonbons with a super-speed punch! Whack! The frail old man proves to be tougher than expected though. Robespierre deigns to enter the fray, but cannot strike the speeding mutant. With time running out, NewGen make an all-out attack on Tarrare, who holds the captive above his head and weathers the blows like a seasoned boxer. Monsieur de Paris lashes out, finally connecting and leaving NewGen's leader worse for wear. The whirling melee of mutants cannot drag down the eternally-hungry Frenchman and the Minions of Robespierre vanish in a flash of eldritch energy, taking the hostage and victory. Despite being, essentially, a glorified play-test, this was a great game and a lot of fun. Despite it being his first game, Steven picked up the mechanics quickly and tried out the abilities of all of his characters. A couple of different dice rolls would have delivered a much different game, which always makes me feel like the game was good. Things I took away from this game; I need to proofread the character sheets better, both NewGen and the Minions had more than one mistake. I also need to write some more scenarios for SS4. The ones in the book are great, but most limit the amount of heroes and Rooftop Rumble and Base Battle require specific terrain to play. Once I get my city roads mat, I'll play more on my city table, and I'd like more scenarios that make use of that space. I'll take a look at some of my old rulebooks for other games and even some comics and see what I can come up with. I need to start this review off with a quick explanation of my understanding of Art and video games as a medium. My undergraduate degree focused on two disciplines, Literature and Film, both of which manage to communicate ideas and emotions in a way in which I consider them a from of art. I am yet to be convinced that video games are an art form in the same way as literature and film. I heard a few arguments and been close to a truly emotional moment in a couple of games, but, by and large, I find that the interactive medium just can't quite get there... yet. I'm not inviting an argument in the comments section, I'm just putting my current hypothesis out there to provide some clarity to the following review. 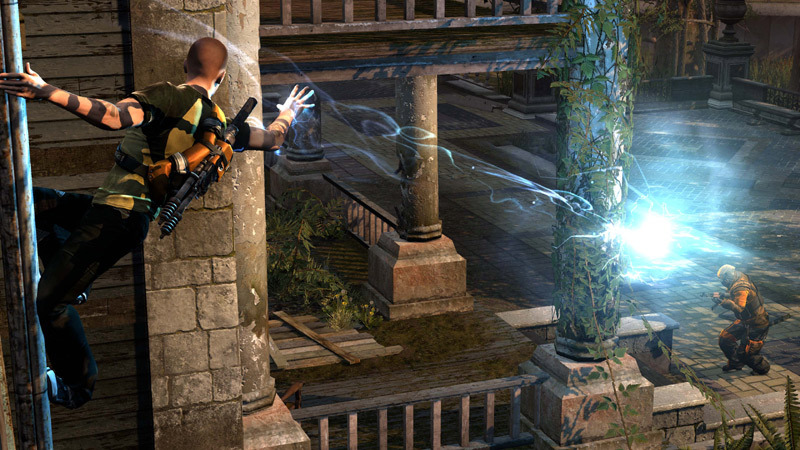 inFamous 2 tells a really compelling story about Cole McGrath, a former bicycle messenger and traceur who gained electrical powers in the first game. Why am I reviewing inFamous 2 instead of inFamous? For some reason, inFamous wouldn't install properly on my PS3, so here we are. In the opening of the game, Cole fails to save Empire City (New York) from a gigantic beast spawned of the same source that gifted Cole his powers. Cole flees to New Marais (New Orleans) in order to buy time to train up his powers for round two; while there he deals with other powered people, monsters and heavily armed locals. The core mechanic of the game focuses on Cole's (and the player's) choices on achieving their goals through "good" or "evil" actions, new powers and story elements unlocking along those lines. I really enjoyed this idea, working along the "good" path by delivering medicine, helping the police keep order and even exposing local political corruption. The problem is that the "evil" path isn't as well defined. To be "evil", Cole beats up random civilians, trashes cars and is somewhat rude to his friends; it's not evil, it's petulance. I have zero motivation to do an "evil" play-through. 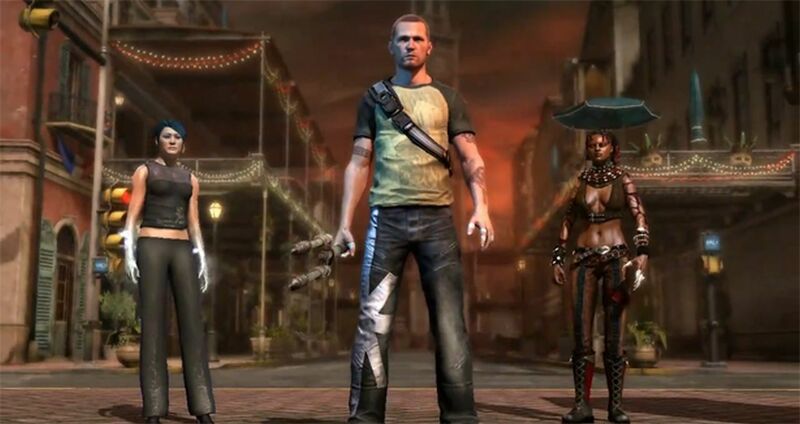 The best parts of inFamous 2 are the ending, which is seriously well-told, and a mission in which Cole earns "good" points by meeting his friend for beers and a movie, it really humanises the character. This would have been a truly grate game actually, if not for a point right before the finale where the player can choose which power set they want. That's right, there's no point playing good or evil, because you can choose to override your choice right at the end anyway. If not for that misstep, I'd be giving a glowing review of inFamous 2, its well-rounded characters, colourful city and strong narrative. As it is, a single choice to pander to interactivity really soured the final experience. Still worth a play-though and plenty of inspiration there for supers gaming if you're inclined though. Progress on this project is looking pretty good, but there are still a tonne of scenarios to write and civilians to paint. At the rate I'm going, 2017 is looking more for the campaign than 2016, but I may as well keep plugging away. Many a student of history will be familiar with Maximilian Robespierre, the Jacobins and the Terror, but that is only part of the story. The secret war for the future of the world that was waged in the hidden, magical places of France would have ramifications that would not be felt for centuries. Seeking a fast path to power, Robespierre discovered the ancient Hermetic traditions, also known as Magic. Not possessing the patients for the extended study required, he became the first modern practitioner of "Chaos Magic", a blending of schools and styles to create a powerful, but unpredictable affect. Robespierre's quest for powerful magical artifacts would form the basis of the conflict in the years to come, he was a master manipulator, even faking his own beheading. Famous during the years of the Revolution for being the greatest executioner in France, the man known only as "Monsieur de Paris" was far more brutal and deadly than pulling the cord on a guillotine. His true history lost to the obsfucations of time, Monsieur de Paris was taken on board by Robespierre early in his career and subtly "improved" by the applications of magic, alchemy and mechanics. How much of the man is left, none can say, but those caught on the wrong end of his claws do not doubt the animal ferocity that still lingers. A former solider and circus freak, Tarrare is cursed with an insatiable hunger and the ability to eat anything. Seeking help to cure his condition, Tarrare sought out Hommes de Bonbons, an infamous alchemist and begged him for aid. Hommes de Bonbons helped Tarrare shed the last of his humanity to become a being of pure hunger. Robespierre now uses Tarrare as a weapon of terror against his enemies, few things can be more terrifying than a beast of flesh devouring everything and everyone in its path. Hommes de Bonbons is nothing if not an experimenter, and perhaps his greatest achievement is Les Enfants Terribles, a group of vampire children bound to be loyal to their master. Les Enfants are a terrifying foe, laughing like children as they chase down their prey and rip it to shreds. The Knights of Dracul are desperate to know how their nature was compromised and warped into these living weapons of the night. Much of the secret work Robespierre does would not be possible without the assistance of the master alchemist Hommes de Bonbons. Though not much of a fighter, Hommes de Bonbons' mind is the greatest of his generation, creating wonders of science that would baffle men of the 20th Century. Just what dark pact Robespierre made with Hommes de Bonbons to have them work together is unknown, but it cannot bode well for the people of France. If even half of what is whispered about Hommes de Bonbons is true, the entire world is in danger.